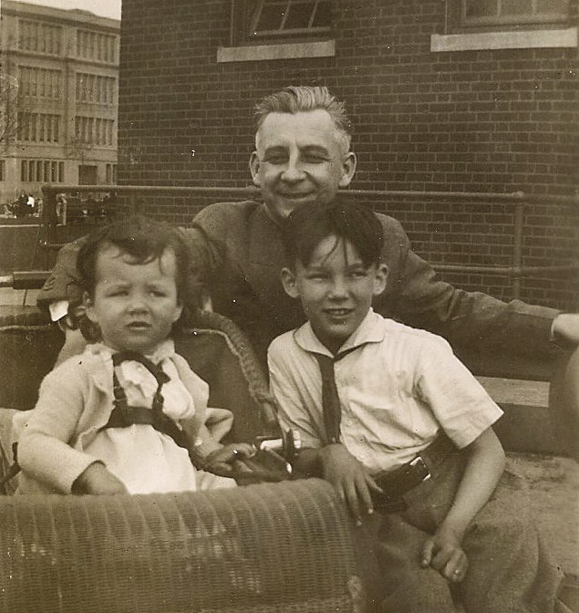 Patrick Killen with his daughter, Margaret, and son, Joseph Patrick, 1934. My grandfather, Patrick Joseph Killen, (“Pop”), was born in Downpatrick, County Down, in 1897. He sailed with his sister Margaret for America in 1911, and arrived in New York on his 14th birthday. Many of his family were already here, but, sadly for him, his older sister Mary stayed behind, and he would not see her again for 57 years. In 1920, Patrick received his Certificate of Service to Able Seaman and began his career as a salvage diver and an underwater welder. 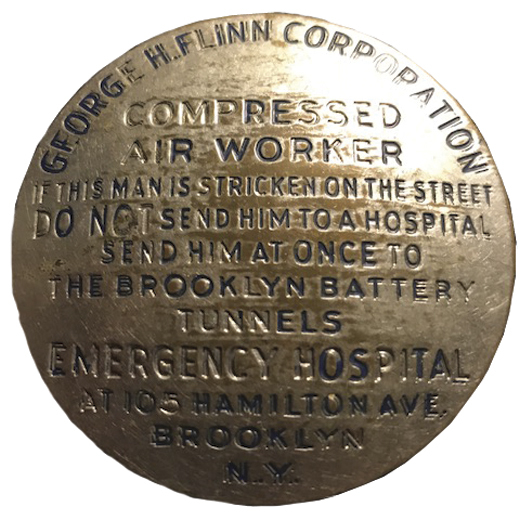 He worked on the piers and bridges around Manhattan until his retirement in 1966. 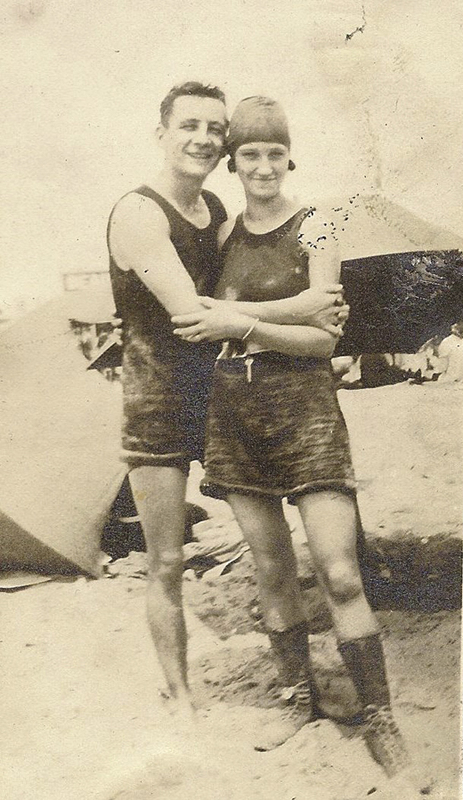 Patrick Killen and Violet Johnston, Brighton Beach, NY, 1923. In 1925, Patrick married Violet Johnston, the love of his life. They had two children, Joseph and Margaret (my mother). He enjoyed his job as a diver, though it was dangerous work. Decompression sickness, also known as “the bends,” was one of the hazards of the job. If a diver rose too quickly to the surface, it could cause nitrogen bubbles to form in the bloodstream and the tissues of the body, and in serious cases, it could lead to unconsciousness and death. Patrick always wore his diver’s pin to let people know that if they came upon him in an unconscious state, he should be taken to the decompression chamber at the Navy Yard – not to the hospital. Patrick’s Compressed Air Worker’s pin. In 1943, during WWII, Patrick worked on the salvage operations of the S.S. Normandie, the flagship Art Deco luxury liner of the French. It was being re-fitted as a troop transport ship when it caught fire and sank in the Hudson River. Joseph “Joe” Killen, Patrick’s son, fought in WWII. He joined the 47th Infantry, 9th Division when he was 18, and received the Silver Star and two Purple Hearts for heroics during the Battle of Remagen. Patrick, himself, was part of the U.S. Navy salvage operations helping to rebuild the U.S. naval ports in Greece after WWII. Patrick Killen tending to another diver, Jim McCamber, 1957. Patrick worked as a diver for 46 years. His last job, before retiring in 1966, was on the construction of the Verrazano Bridge, which marks the gateway to New York Harbor. 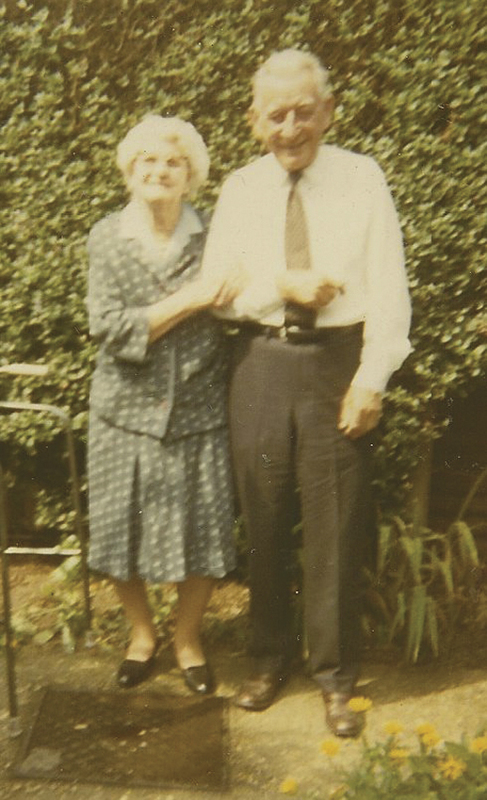 In 1968, Patrick flew to Old Woking, England, to see his sister Mary, who was then 81. He hadn’t seen her since she had hugged him goodbye in 1911. Patrick was truly dedicated to his family, his Irish heritage, and his Catholic faith. He also knew how to have fun, and he’d laugh so hard that tears would run down his cheeks. He and I had a special bond. 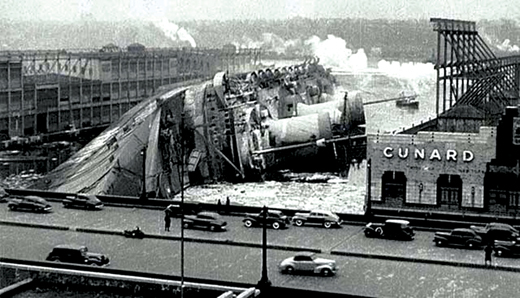 The SS Normandie lies on its side on the Hudson River after a fire aboard the ship. 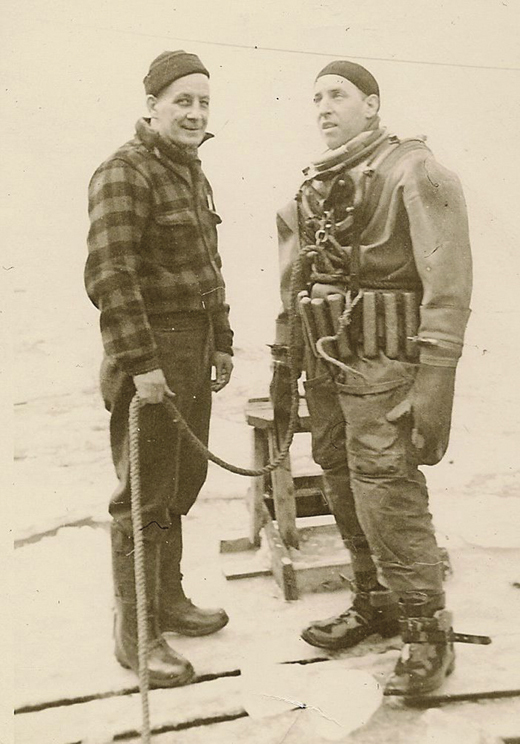 It was Pop’s passion and love for the sea that inspired me to create highly specialized protective fabrics; specifically, the Marine Corp F.R.O.G (Fire Retardant Operational Gear), and the Army and Marine Corp P.U.G. (Protective Undergarment) designed to protect military personnel from the damaging and life-threatening impacts of blast wounds caused by IED explosions and shrapnel in combat. Pop passed away in 1975, and I inherited his diver’s pin, which I treasure. To me, it embodies the hard work, sweat, and determination of all immigrants who, like Pop, came to America wanting a better life for their families, and went on to leave their mark on the landscape of the country. Patrick and his sister, Mary McAllister, meet up in England after 57 years, 1970. Thirty years after Pop died, on a beautiful October day, I drove to Fire Island to surf fish for the day. Later, before heading home to Pennsylvania, I decided to stop by the Fire Island Lighthouse, which has special meaning for the Killen family. It was just before sunset when I parked. And as I looked over to the car parked next to mine, I recognized my cousin, Jim Killen. We had not seen each other in many years. “Do you know what day it is?” Jim asked in greeting. “Yes. It’s a remarkably beautiful Sunday in late October,” I replied.